A nuclear waste dump on the moon unexpectedly detonates, blasting the moon out of orbit and taking the inhabitants of Moonbase Alpha on a fantastic voyage of discovery to the stars, fraught with danger at every turn. Special Features Long awaited on Blu-ray, Gerry Anderson's cult sci-fi series is presented here in stunning High Definition for the first time. 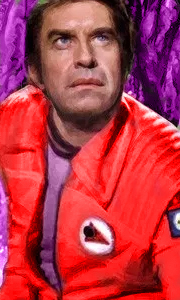 All 24 episodes, with optional original mono or new 5.1 soundtracks, are featu..
A nuclear waste dump on the moon unexpectedly detonates, blasting the moon out of orbit and taking the inhabitants of Moonbase Alpha on a fantastic voyage of discovery to the stars, fraught with danger at every turn! Gerry Anderson's massively popular sci-fi series is presented here as stunning restorations from original film elements, giving an exceptional level of picture quality - Space: 1999 has never looked better. Special Feature.. The Moon's galactic odyssey continues for the inhabitants of Moonbase Alpha in the second series of Gerry Anderson's epic space adventure. The base and crew have undergone many changes, and there's an intriguing new alien presence amongst the Alphans in the form of metamorph Maya – a refugee from the planet Psychon. Space: 1999's second series is a radical departure from the cerebral science fiction of the first, with the accent firmly ..
Own Space 1999 Series 1 DVD from Deff, DVD, Blu-Ray & 4K Video Specialists - Free UK Delivery..
Own Space 1999 Series 1 to 2 Complete Collection DVD from Deff, DVD, Blu-Ray & 4K Video Specialists - Free UK Delivery..
Own Space 1999 Series 2 DVD from Deff, DVD, Blu-Ray & 4K Video Specialists - Free UK Delivery..